Trapped in a three-sided struggle between his fellow Pathfinders, an ancient wizard, and the agents of death itself, Valeros struggles to understand what his life has become and retain control of his own living body! The Spire of Bones story continues in this tale written by Pathfinder developer Crystal Frasier with art by Tom Garcia (Mercy Thompson, Pathfinder: Hollow Mountain). Contains an ongoing Starfinder bonus story, a Pathfinder RPG rules appendix, and a bonus pull-out poster map! 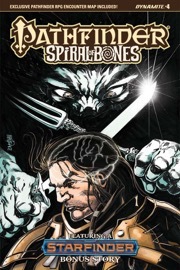 Sign in to start a discussion about Pathfinder—Spiral of Bones #4 (Standard Cover—Tom Mandrake)!